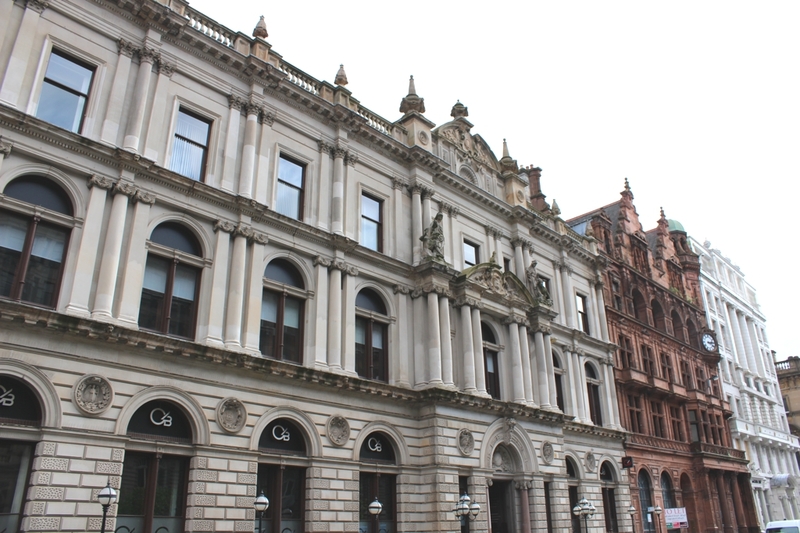 The next building to be ticked off the list is 30 St Vincent Place by John Burnet Snr, likely more commonly known to you as the Clydesdale Bank HQ. Whilst this is the first of several John Burnet Snr buildings that will be featured on this blog, the Burnet family have already made an appearance – see this post on one of his sons, Sir John James Burnet’s, buildings. (It is also interesting to note that Burnet’s brother, William Cadell Burnet, was also an architect, continuing the trend of architecture during this time period being quite the family affair). John Burnet Snr was largely self-trained, having begun his career as an apprentice joiner, graduated to a clerk of works before becoming an architect. 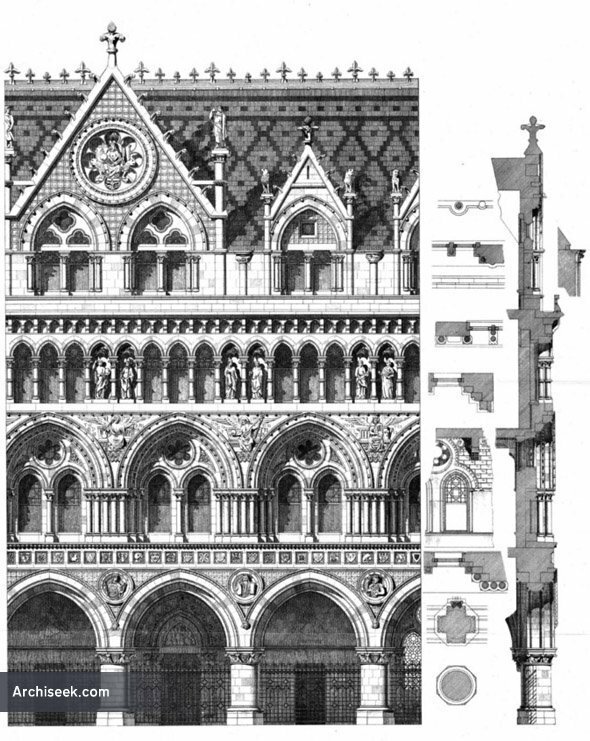 He worked in a variety of styles, from Greek to Gothic, and relied on his extensive library for precedents, for example his design for the Glasgow Stock Exchange was heavily influenced by William Burges’s London Law Courts (his brother William obtained a copy of Burges’s portfolio for John from London). Whilst Burges’s Law Courts design was never executed he was clearly aware of the Burnet building as he later added the drawings of it to his own portfolio! However, that is a building for another day! 30 St Vincent Place is an example of John Burnet Snr utilising the Italian (more specifically Venetian) Renaissance style to substantial effect. 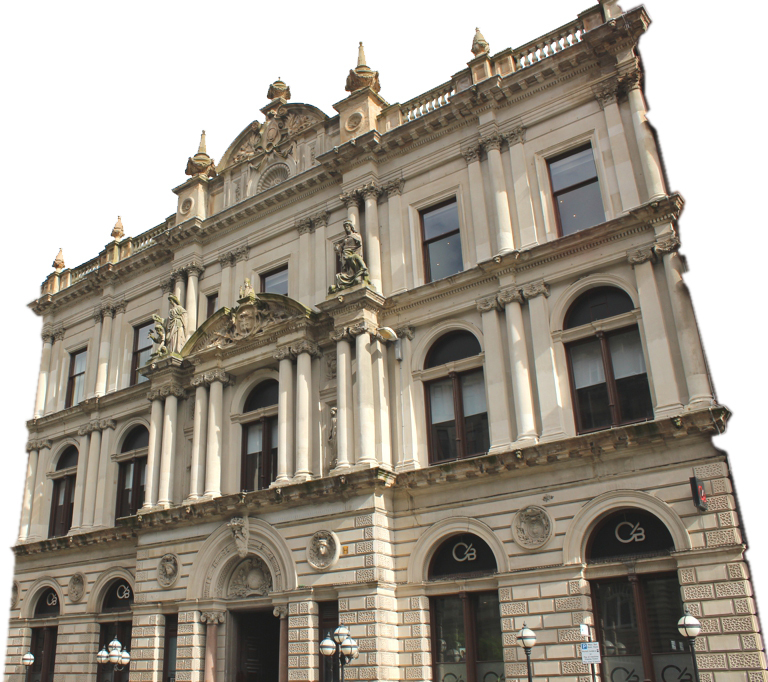 Frank Worsdall, when discussing this building in his excellent ‘Victorian City: A Selection of Glasgow’s Architecture’ book, prefaced the description by explaining the background that would have influenced Burnet’s stylistic decision in 1870. This mention of JT Rochead is likely the most significant as in 1867 Rochead completed the Bank of Scotland building at 2 St Vincent Place, however, Burnet had already adopted Italianate styles in a number of similar commissions from 1865 onwards. The two buildings are further linked by the use of the Mossman family for the sculpture on both, with William Mossman taking on the JT Rochead building and his son, John Mossman, leading the sculptural work on Burnet’s. So let’s consider the composition in it’s original format. The building is constructed of a very light blonde sandstone, at ground level ashlar with deep channeled joints is used, with the quoins being vermiculated. A continuous cornice runs across the story at three-quarter level picking up each of the arches, above which the joints are then only channeled horizontally. In the flanking bays circular medallions are located in the spandrels, containing depictions of a vase with flowers and a ship. The central entrance element projects forward at ground level and contains a tripartite doorway consisting of two narrow rectangular windows and a round arched door in the centre, creating an embellished version of a typical Palladian window. However, the impact of this is perhaps slightly lessened by the recession of the cornice above the rectangular windows. Above each of these are further medallions containing crowned heads surrounded by thistles (I have thus far been able to uncover who or what specifically these two are meant to represent). At the doorway, to red granite columns with decorative ionic capitals carry the rounded arch, the keystone of which depicts Father Clyde. 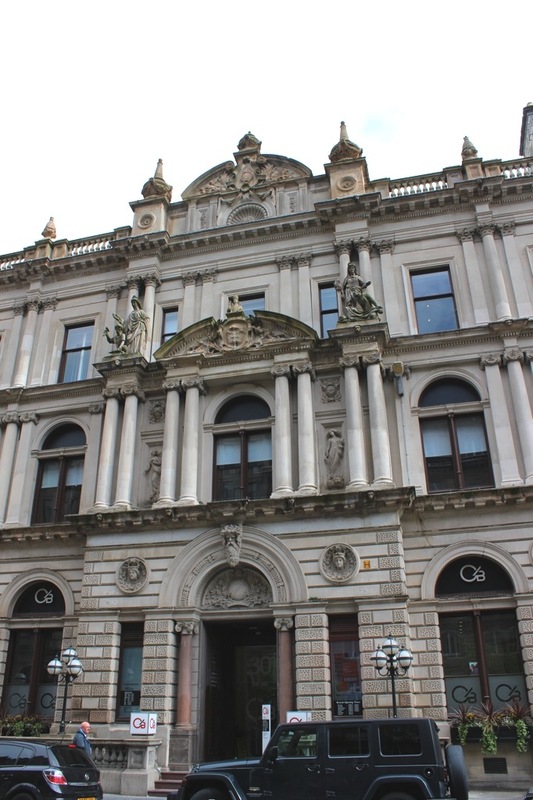 The allegorical figure developed to represent the bounty and generosity of the Clyde to Glasgow at a time when it was at the heart of trade and industry in the city. Set within the arch is a heraldic carving of a winged globe surrounded by flowers, with the inscription “Litore ad Litus”, which seems to translate to “Coast to Coast” (read ‘seems’ as ‘a quick google’). 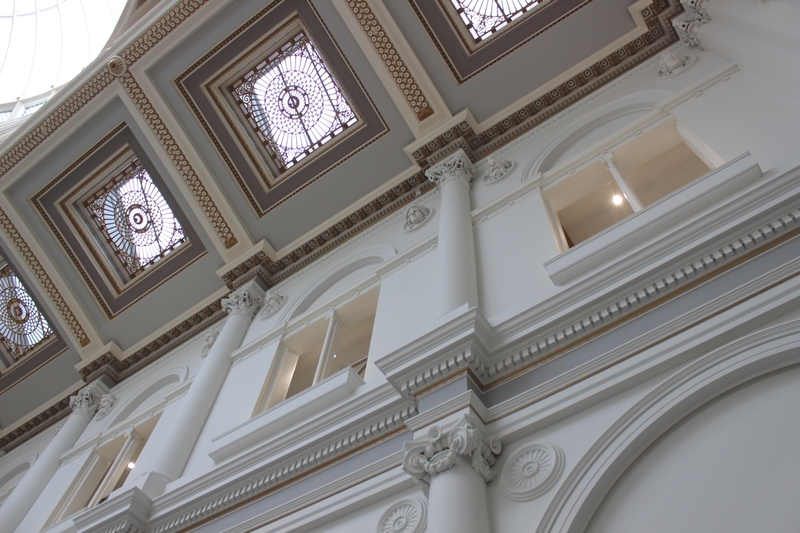 The ground floor is concluded by a modillioned cornice bearing what appear to be lion heads below each set of paired columns. At first floor level the use of ionic columns is continued, the flanking bays have paired square pilasters either side of an engaged column. The use of bipartite rounded arch windows, divided by a skinny cast iron mullion, is also continued, although these are shorter than those on the ground floor. 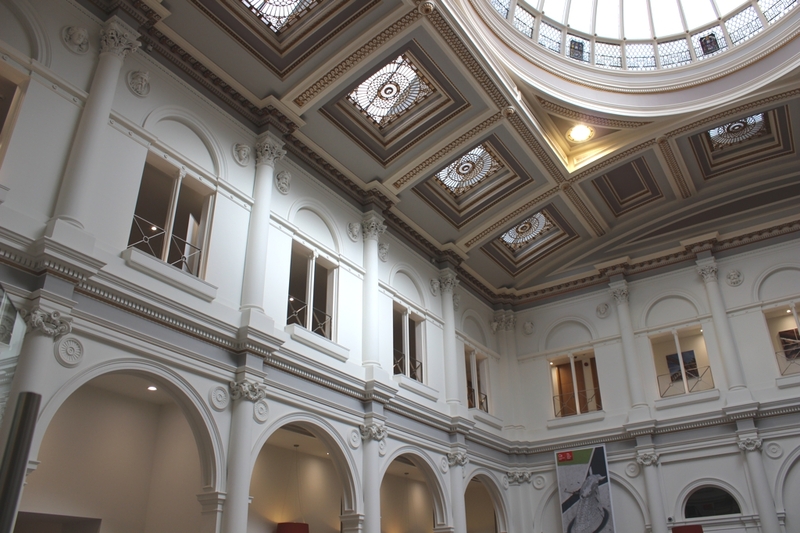 Centrally, the main wall is no longer advanced, but paired ionic columns carrying sculpture groups and a broken pediment continue the building line established at ground floor. Replacing the rectangular windows of the ground floor are figure sculptures; to the right is a woman holding a scythe and bushel with a ship in the cartouche above, the left panel appears to show a woman holding cloth with a dove above. 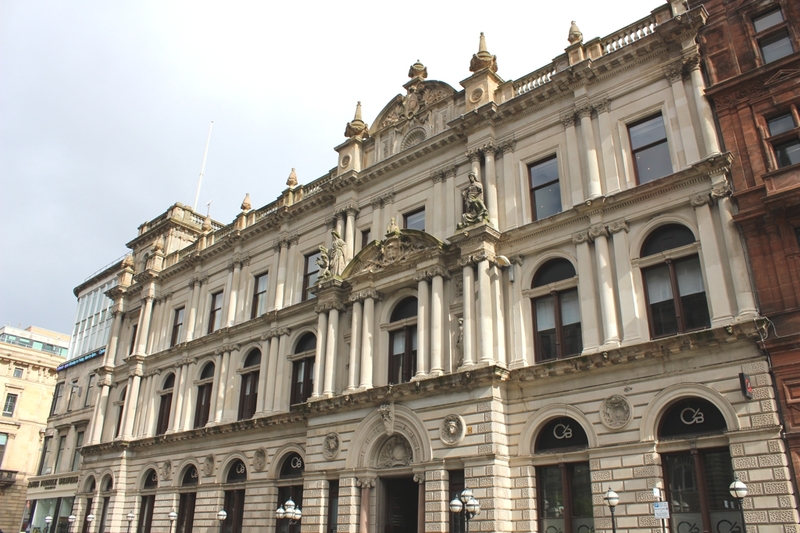 Atop the doubled columns are a pair of sculpture groups representing industry and commerce, whilst centrally the broken pediment encloses the coat of arms of Glasgow, with the figure of St Mungo over it. At the third floor Burnet substitutes the use of ionic columns for corinthian in the same pattern as the first floor, aside from the two central pairs, where the building line is fully stepped back with the use of square pilasters. The round-arched windows are replaced with rectangular windows of a reduced width and height also. These choices all act as optical devices that increase the verticality emphasis of the composition and create an impressive feeling of scale for those entering into the building. To conclude the third floor Burnet combines the dentil and modillion cornices of the floors below, replacing the ground floor’s square pattern with console brackets, the lion heads are also now paired centrally. 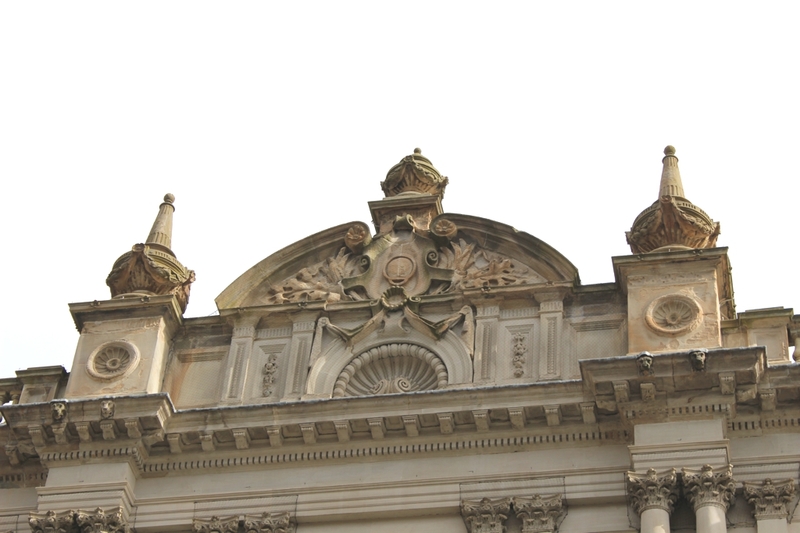 A balustrade with urns atop dies runs above the cornice until it reaches the final pediment. Two advanced pedestals sit either side of it carrying finials, whilst the pediment enclosed a plinth for a final uppermost urn. Set within it is a cartouche surrounded by leaves with a shell pattern below. It is also fitting to discuss the quality interior of this building, although the quality of photos you get when pretending to pay in a cheque aren’t wholly desirable! The banking hall is 5 bays wide and 5 bays long, although rectangular in plan. 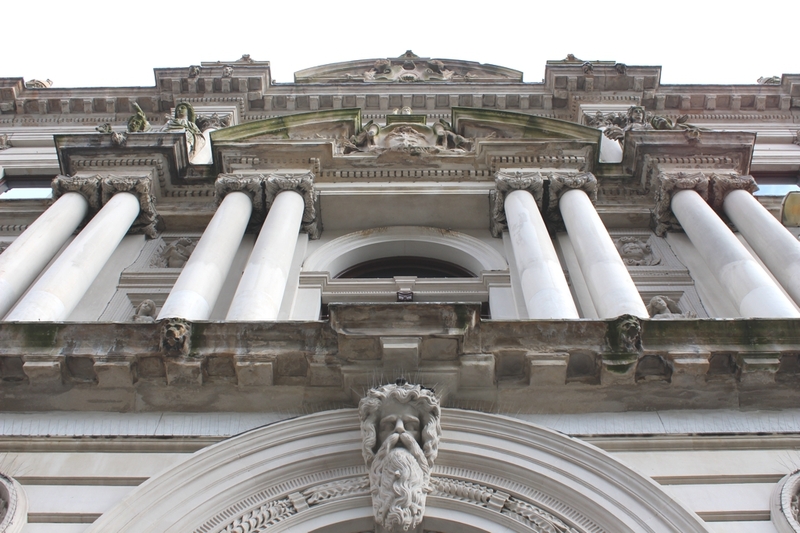 At ground floor level rounded arches are divided by ionic columns, there are decorative medallions in the spandrels with a dentil cornice above. At first floor corinthian columns are used whilst the round arched window of the exterior is translated into an internal opening with a solid but recessed transom replacing the fanlight of the exterior, and again a tiny ionic mullion in cast iron. In the spandrels are a series of carved heads that run around the hall. 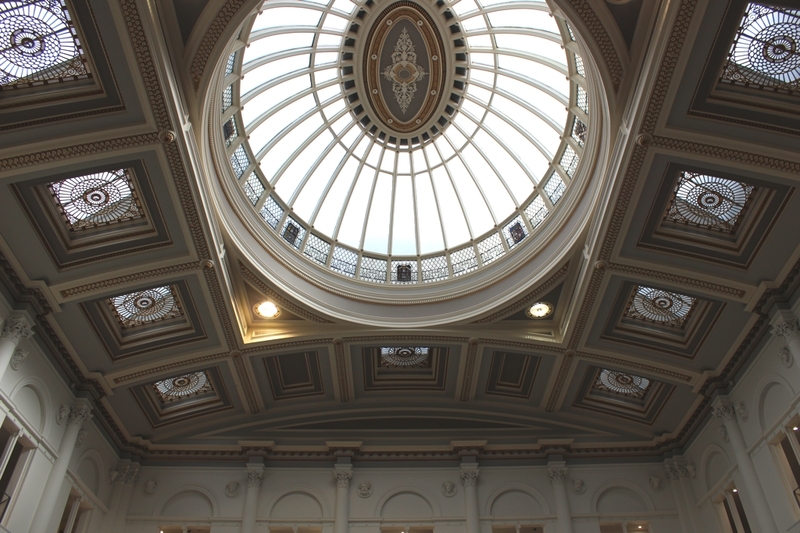 The arched ceiling that enclosed the space is really rather spectacular, each of the coffers contains a decorative leaded glass panel whilst centrally a huge elliptical cupola floods the space with light. Whilst externally the composition of the building is compromised by its lack of symmetry this building provides a number of points of interest; the way Burnet cleverly enhances the vertical emphasis of his facade design, the stunning interior and of course the truly excellent sculptural work of John Mossman and also Charles Grassby who assisted Mossman. Given it’s central location, just off of George Square this certainly deserves a few minutes of your attention and admiration! Welcome back! And happy new year to you too.